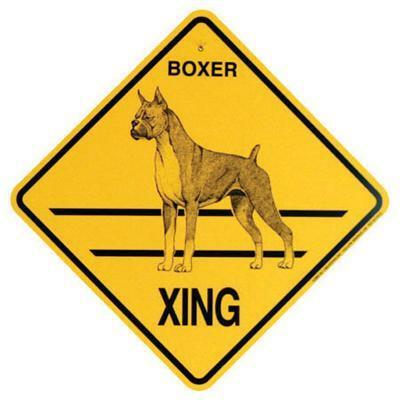 Let people know that your Boxer (cropped ears) may be crossing at any time! Sign is made of high impact polystyrene (plastic) and is suitable for Indoor or Outdoor Use. Eye-catching graphics and original artwork make them perfect for any yard or home decoration. They make great gifts for birthdays, holidays, awards, new puppy gift or just buy one for yourself! Measures Approx 10-1/2" x 10-1/2"